Development of hyperbilirubinemia, concurrent or subsequent to hyperthyroidism, can be due to thyrotoxicosis per se, or due to drug treatment of hyperthyroidism. Other rare conditions: autoimmune thyroid disease, or causes unrelated to hyperthyroidism like viral hepatitis, alcohol abuse, sepsis, cholangitis, or as a side effect of certain medications. In this article, we review these causes of co-existent hyperthyroidism and jaundice. We also highlight the changes to be expected while interpreting thyroid function tests vis-a-vis liver function tests in this subgroup of patients. Background : Functional status/contractile behaviour of hibernating myocardium was analyzed objectively by analyzing the available quantitative parameters obtained on gated SPECT myocardial perfusion imaging (MPI) using Emory cardiac toolbox (ECTB) software.Materials and Methods: In this retrospective study, 70 patients with perfusion defects on 99 Tc-Sestamibi MPI (12 females, 58 males) who also underwent 18 F-FDG Cardiac PET study for assessment of hibernating myocardium were included for analysis. 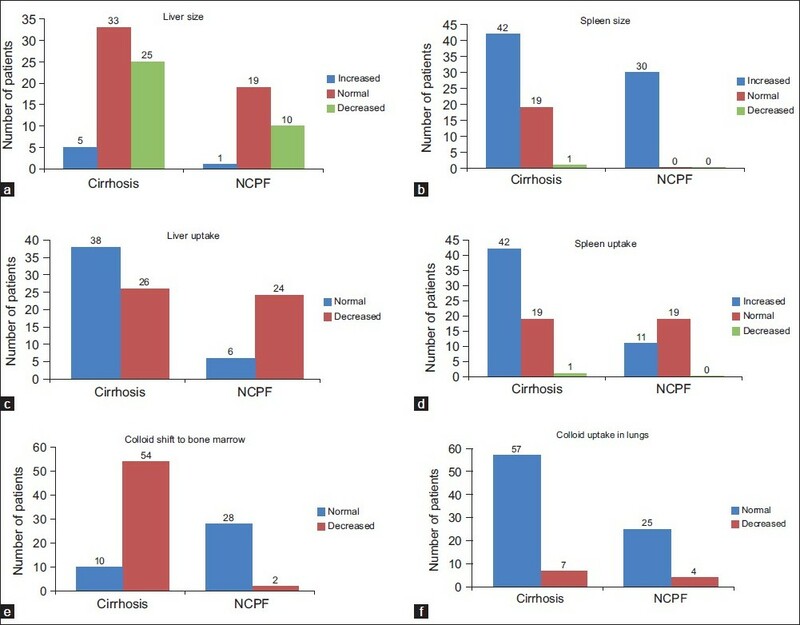 Patients were divided in three categories based on summed rest score (SRS) obtained from ECTB software, depicting the extent of perfusion defects. In a study population matched for extent of perfusion defects, quantitative parameters obtained from ECTB software such as left ventricular ejection fraction (LVEF), left ventricular end diastolic volume (EDV), left ventricular end systolic volume (ESV) and left ventricular stroke volume (SV) were compared between patients showing evidence of hibernating myocardium and patients showing no evidence of hibernating myocardium. Student 't' test was applied on the given observations and a P-value <0.05 was considered as a significant difference between the means in two categories. Results: There was no significant difference in LVEF, EDV, ESV and SV measurements between those who demonstrate hibernating myocardium and those who show no evidence of hibernating myocardium across all the categories of patients. 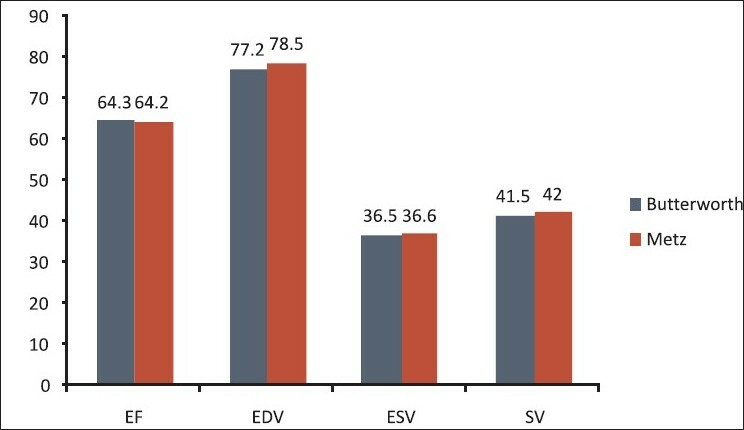 Few trends were evident in the present study in LVEF, EDV and ESV measurements i.e., fall in mean LVEF with increasing SRS and rise in mean EDV and ESV with increasing SRS. Conclusions: The findings were consistent with the nature of hibernating myocardium i.e., non-contractile and dysfunctional. 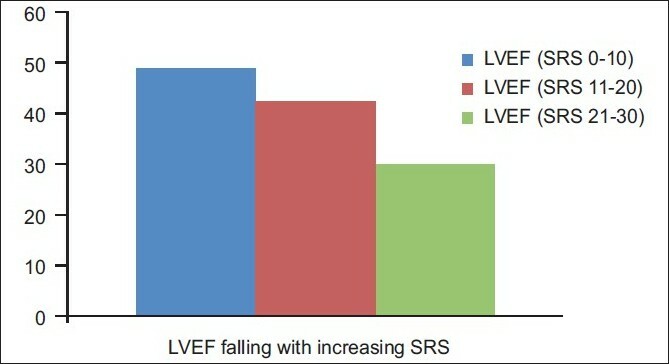 The fall in the LVEF was suggestive of deteriorating myocardial function with increasing extent of perfusion defects. The increasing left ventricular EDV and ESV with increasing extent of perfusion defects was suggestive of rising incidence of gross morphological LV cavity dilatation or "Dilated ischemic cardiomyopathy" in these patients. Background : To evaluate the role of positron emission tomography-computed tomography (PET-CT) in staging and determining early treatment response to chemotherapy in children with neuroblastoma (NB) and its correlation with the final outcome. Patients and Methods: Seventeen patients of NB with mean age of 51.5 months (age range 2-132 months; 14 males, 3 females) underwent serial 18F-flourodeoxygl ucose (FDG) PET-CT imaging. All 17 patients were for staging before any treatment. Twelve of 17 patients underwent I-131 meta-iodobezylguanidine (MIBG) scan and bone scan. MIBG uptake was seen in the primary lesion in 11/12 patients. 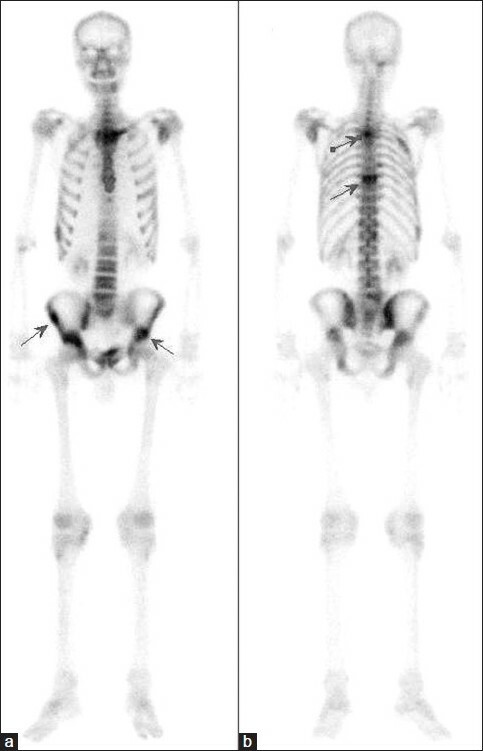 MIBG uptake in bones was seen in 3/12 patients. All bone lesions were concordant on MIBG and bone scan. Early response to chemotherapy was evaluated after two cycles using PET-CT. A 30% reduction in longest diameter was taken as cut-off value for response on CT based on the response evaluation criteria in solid tumors criteria. Response on PET-CT was assessed using percentage improvement in lesion to background SUV ratio, taking a value of 50% as cut-off. Final outcome based on follow-up ranging from 6 to 43 months (mean 18.8 months) served as reference. Results: All 17 patients showed increased FDG uptake at the primary site. Seven of the 17 patients (41.2%) showed metastasis. Lymph nodes were the most common site of metastatic disease followed by bone, bone marrow, lung and meninges. For response evaluation, change in the size of the primary tumor was noted in 11/17 (64.7%) patients on CT. Treatment response was noted in 12/17 patients (70.6%) on PET-CT. Eleven out of 17 (65%) patients showed response in both CT and PET-CT. Five out of 17 patients showed no response in both. Discordant findings on CT and PET were noted in one (5.9%) patient where PET showed response but no response was seen on CT. Two patients with initial response but with distant metastases expired during follow-up. Conclusion: PET-CT has potential in the initial staging of NB. PET-CT also appears to be a good modality for response assessment in patients with moderate and high FDG uptake on the baseline scan. However, no significant beneficial effect was seen in patients with low baseline FDG uptake. Background : ECG -gated myocardial perfusion imaging is a sensitive test for diagnosis of ischemia as well as scarred myocardium. It provides additional information on global and regional myocardial contractile function. A number of methods are available to calculate left ventricular volumes and ejection fractions, which depends on various technical and patients specific factor. Objective: This study was carried out to measure effect of reconstruction filter in calculations of left ventricularend diastolic volume (EDV) and end systolic volume (ESV) and left ventricular ejection fraction (LVEF) from 99mTc-sestamibi myocardial perfusion imaging. Materials and Methods: 99mTc-sestamibi-gated SPECT myocardial perfusion imaging was performed in 90 patients. Studies were reconstructed with Butterworth and Metz filters. Results: Mean ejection fraction with Butterworth and Metz filter are 64.3 and 64.2, respectively. Mean EDV is for Butterworth and Metz filters are 77.3 and 78.5 ml, respectively. While ESV was 36.49 and 36.63 ml, stroke volume calculated was 41.54 and 42 ml for Butterworth and Metz filters,respectively. Pearsons's correlation coefficients between results calculated with Metz and Butterworth filters were 0.994 for ESV, 0.996 for EDV, 0.966 for LVEF and 0.925 for SV. Student 't' test was applied on the data and no significant difference was noted between parameter estimated by Butterworth or Metz filter. Conclusion: This study shows that difference of filter application has no significant effect in computing left ventricular function parameters. Intraocular choroidal metastasis is a very rare cause of blindness. Choroidal hemangioma and melanoma are other causes that may mimic the condition. Carcinoma of breast is the most common primary malignancy that accounts for choroidal metastasis in females and carcinoma of lung is the most common cause in males. Other primary neoplasms which can uncommonly metastasize to the choroid are testis, gastrointestinal tract, kidney, thyroid, pancreas, and prostate. Metastatic neoplasm to the eye outnumbers the primary tumors such as retinoblastomas and malignant melanoma. 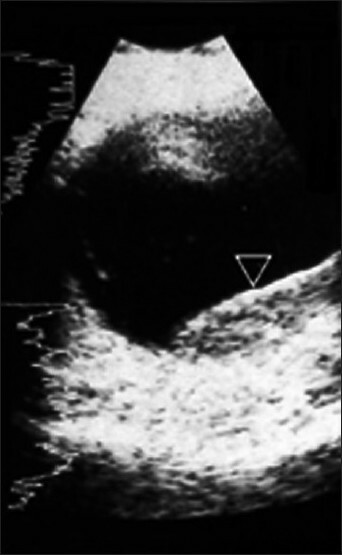 Sonography is usually the initial investigation after fundus examination to look for the architecture of the lesion. However, it lacks in specificity. We present a case of carcinoma of breast that had visual disturbances and wholebody F18-fluorodeoxyglucose, positron emission tomography-computerized tomography (FDG PET CT) revealed a choroidal lesion in addition to cerebral, pulmonary, and skeletal metastases. Choroidal metastasis from carcinoma of lung has been reported previously on FDG PET. To the best of our knowledge, this is the first case report of carcinoma of breast demonstrating choroid metastasis on F18-FDG PET CT scan. Langerhans cell histiocytosis (LCH) is a rare histiocytic disorder in which pathological langerhans cells accumulate in a variety of organs. Manifestations may include lung infiltrates, lymph node involvements, bone lesions, hepatic, hematopoietic and endocrine dysfunctions. 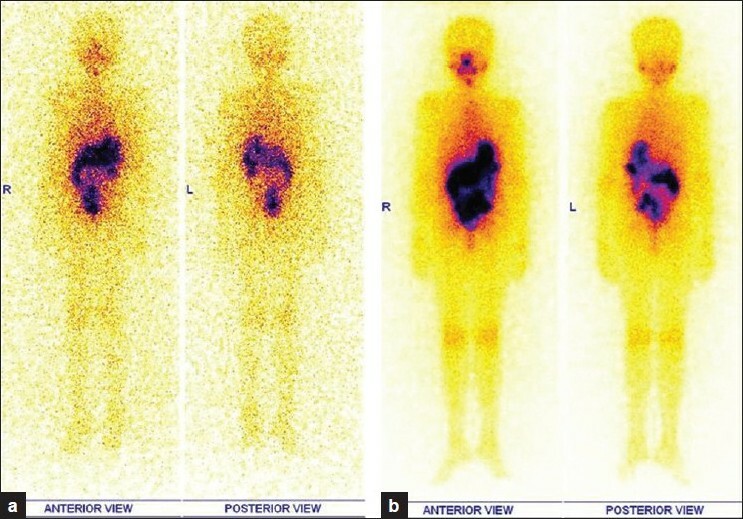 In this case report we present fluorine-18 positron emission tomography (F-18 PET/CT) and bone scintigraphy findings of a 18-year-old male patient with disseminated LCH, mimicking multiple hypermetabolic metastatic lesions. Clinicians should be aware that LCH infiltrations can be seen as intense uptake and to differentiate infiltrations from other metastatic intense uptake with fluorodeoxyglucose PET/CT and bone scintigraphy, clinical and laboratory findings should be kept in mind. Thyroid carcinoma metastatic to the paranasal sinuses is extremely rare. We report a case of follicular thyroid carcinoma metastatic to the right maxillary sinus, with extension into the right side of the hard palate in a young lady. 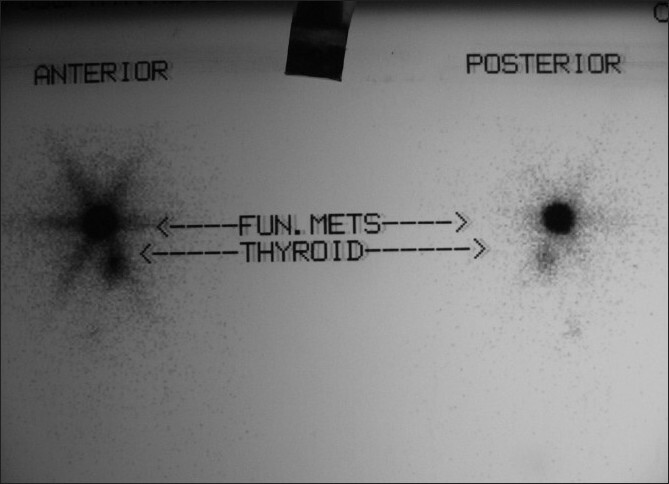 A radioactive iodine-131 (I-131) scan post total thyroidectomy revealed 0.8% uptake in the neck; the whole body scan revealed a functioning metastasis in the region of the right maxillary antrum. Pathological confirmation of metastasis was done by correlating the fine needle aspirate cytology with the thyroidectomy histology. The patient initially received 40 Gy of external beam radiotherapy, subsequently, she received 110 millicuries of I-131, followed by 50 millicuries 6 months later. She continues to be on follow-up on Eltroxin™ suppression and has remained disease free for the past 4 1 / 2 years. Splenic metastasis in differentiated thyroid carcinoma is rare occurrence. 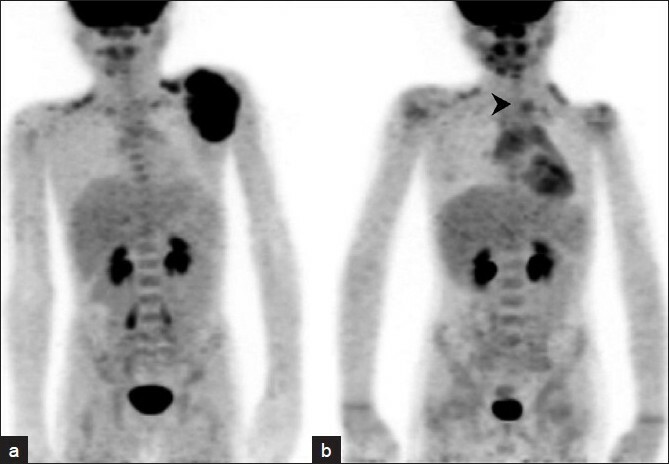 We describe an unusual case of diffuse metastatic splenic involvement with normal hematological indices in differentiated thyroid carcinoma demonstrated by post-therapy whole body radioiodine scan. We present a paediatric case of Papillary Ca thyroid under evaluation for elevated Thyroglobulin (Tg) level with negative 131 I wholebody scintigraphy. Differentiated thyroid cancer (DTC) arises from follicular epithelium and retains basic biological features like expression of sodium iodide symporter (NIS), which is the cellular basis of radio iodine ( 131 I) concentration during thyroid ablation. 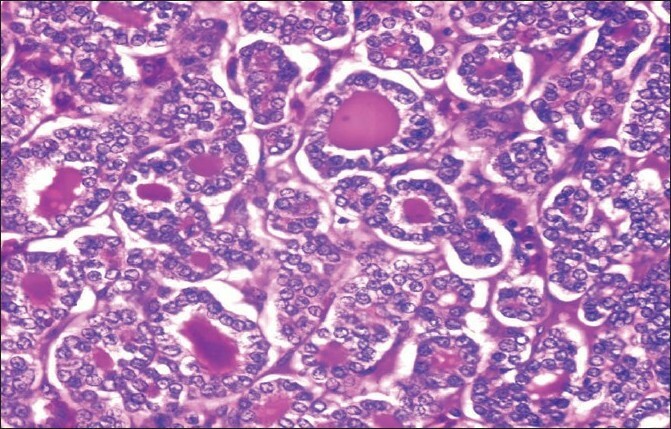 Once dedifferentiation of thyroid cells occurs, cells fail to concentrate 131 I, posing both diagnostic and therapeutic problems in DTC and one may have to resort to other imaging techniques for disease localization. As DTC progression is slow, patients have a relatively good prognosis. However children with thyroid malignancies need aggressive management, as initial presentation itself maybe with nodal metastases. 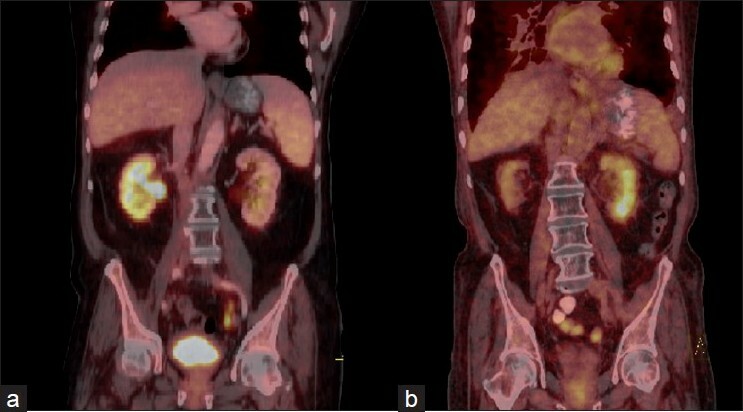 It is well known that FDG PET CT apart from its oncological applications, is also used in the evaluation of vascular inflammation especially Takayasu's arteritis. It is also reported in literature, that 18 F-FDG uptake can be seen relatively frequently in the arterial tree of cancer patients. Dunphy et al reported the association of vascular FDG uptake in inflammation as well as in normal arteries. This study typically describes FDG uptake in a patchwork of normal vessel, focal inflammation and or calcification of vessels. The other plausible reasons for significant vascular 18 F-FDG uptake are drugs such as potent non steroidal anti-inflammatory agents, dexamethasone, prednisone and tacrolimus. Our patient showed false positive 18 F Fluorodeoxyglucose (FDG) uptake in spinal cord at D11/12 and D12/L1 vertebral levels in FDG PET CT imaging performed as part of raised Thyroglobulin workup. This intra spinal FDG uptake is attributed to physiological uptake and inadequate FDG clearance from artery of Adamkiewicz, which can be added as a new physiological cause of FDG uptake unreported in literature as yet. Occasionally the thymus may extend in the neck, from its normal location in the anterior mediastinum. The cervical extension, especially when the native thymus is hyperplastic, can mimic a mass. We describe the detection of cervical extension of the hyperplastic thymus, presenting as a suspicious recurrent soft tissue mass in the neck in a patient with Ewing's sarcoma. Authors describe diagnostic dilemma of differentiating pyelonephritis with lymphomatous involvement of kidney in a known case of lymphoma. FDG uptake pattern was non-discriminatory and pyelonephritis diagnosed retrospectively on follow up study. Authors emphasize the importance of recognition of features and subtle clues of infection evident on CT component of PET-CT.